Screw anchors are installed to an engineering torque specification. By the time installation torque is reached and the operator stops the machine, the pile has built up rotational energy (somewhat like a rubber band on a wind up model aeroplane). This causes the pile to momentarily 'kick back', forcing the energy back up the pile through to the drive shaft, the gearbox, and the hydraulic motor. This action effectively turns the motor into a high speed pump, generating cavitation of the motor, which causes motor failure and expensive replacement costs. 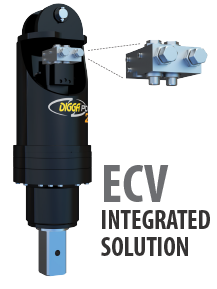 Digga's revolutionary flow reversal bypass valve (Energy Control Valve) can be fitted to the drive manifold to control the release of this energy. Digga’s Energy Control Valve can be fitted to all PD drive units for screw anchoring applications. ECV comes standard on all Digga anchor drives.